Refreshing, colorful, and flavorful with a feisty spice kick, this obsession-worthy ceviche-like dish hails from L.A.’s famed Mary Sue Milliken and Susan Feniger (who were featured in our Spring 2015 issue). A snap to prepare, it’s a perfect hot-weather meal, especially when paired with tortilla chips and gluten-free beer. Slice squid into 1⁄8-inch rings and cut the heads in half. In a small pot, bring the fish stock to a boil, season to taste with salt, and add the squid. Lower the heat to a simmer and turn off the heat. Let the squid finish cooking as the broth cools. Transfer the squid to a bowl and chill thoroughly, reserving the broth for another use. Cut 1 cucumber half into chunks, put it in a blender or food processor with 1 tablespoon water, the cilantro, chile, lime juice, and 1⁄2 teaspoon salt, and blend until liquefied. Strain through a fine-mesh sieve, discard the solids, and transfer the liquid to a large bowl. Chill thoroughly. Peel the remaining cucumber half and cut into 1⁄4-inch dice. 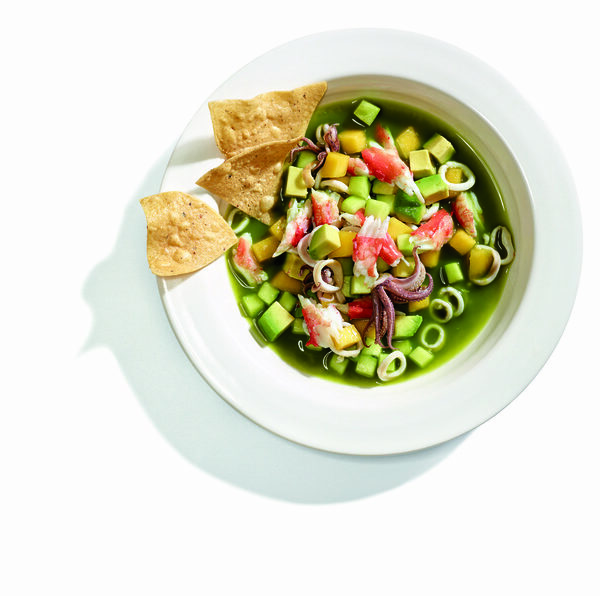 Add the cucumber, squid, crabmeat, avocado, and mango to the bowl with the chilled cucumber-chile liquid. Gently mix until combined. Transfer to a serving bowl or individual bowls and serve.